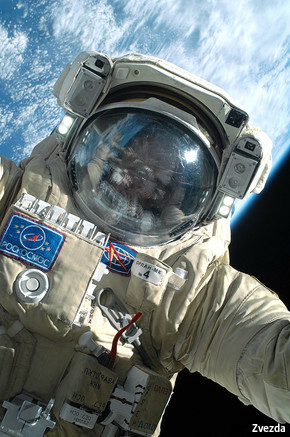 Spacesuits: A new generation of outfits for astronauts is being developed. Behind on my posts again…here is my piece in the last edition of The Economist’s Technology Quarterly. NASA’s new spacesuit was a big story in US/UK, but my story contains exclusive material from NASA. I was also the only journalist I believe to find out what private space and the Russians were up to. Read in full below or by following this link. AROUND 230,000 votes were cast in a recent online competition held by NASA to choose one of three designs for the American space agency’s new Z-2 spacesuit. It was not the technology that people were invited to vote for, but the style of the outer layer. The winner (pictured right) features vivid-blue electroluminescent wire and patches, exposed bearings and natty collapsing pleats to improve an astronaut’s mobility. 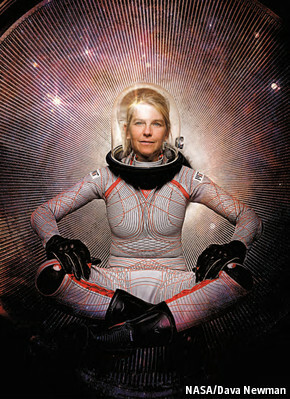 Other new spacesuits are in development, including the one pictured above being modelled by its inventor, Dava Newman, a professor at the Massachusetts Institute of Technology. Instead of being pressurised to protect the body from the vacuum of space, it uses complex ribbing to hug the contours of the occupant’s body. One thing these new spacesuits share is that they look like they could have come from early illustrations in science fiction—or even a vintage episode of “Doctor Who”. The spacesuits worn by science-fiction characters from decades past tended to be shorn of much of the complex paraphernalia that is actually required to keep someone alive in space, like the bulky equipment-laden suits the Apollo astronauts wore on the Moon in 1969. With new materials and technological advances, spacesuits can now be made lighter and less cumbersome. Much of the impetus for new designs comes from the emergence of a private space industry. SpaceX, a California-based rocket company run by Elon Musk, has advertised for its own spacesuit designer as it moves from supplying the International Space Station to manned space flight. In May Orbital Outfitters, an American firm, unveiled its design for the pilot and fare-paying passengers on Lynx, a reusable spaceplane being developed by XCOR Aerospace, another Californian company. Many of the features of existing spacesuits date back to the Apollo missions—and some to the g-force suits used by U2 high-altitude spy planes in the 1950s. The suit that Sandra Bullock wore in the film “Gravity” was certified in 1980 for use by the crews of the Space Shuttle. Back then, few at NASA would have imagined that its working life might run to around 40 years. Whatever a spacesuit looks like it has one basic function: to keep its wearer alive. There are three types of suit. 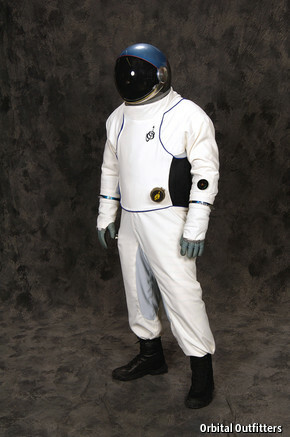 First, there are pressurised flight suits that astronauts (and future space-tourists) have to wear. Then there are suits for extravehicular activities (EVAs), such as spacewalks. These use additional equipment, like portable life-support systems. For the designer, these suits have the advantage that they can be heavy because they will be used in a weightless environment. Finally there are the type of suits not seen since the days of Apollo. These will be needed to explore and work on planetary bodies where there is gravity (on Mars, gravity is one-third that of Earth) and even an atmosphere. This makes weight an issue. The suits also need to protect an astronaut from radiation and be capable of being serviced and repaired during the mission, which could last for several years. NASA says the Z-2 suit will be tested in a vacuum chamber later this year before the final specification is defined. One of the most visual changes is the idea of a “suitport”. This involves attaching and sealing the rear of the spacesuit to the outside of the spacecraft. The astronaut then opens a hatch to climb into the spacesuit from the rear, seals himself in and detaches for a spacewalk. To return, he backs up to the hatch, reseals the suit to the outside and exits from the rear. This avoids the need for a complex airlock. Another innovation is a back plate that resembles a plug-in computer circuit-board. This allows components to be slotted in and out, making it easier to repair and upgrade. Perhaps the biggest and most expensive change is a new portable life-support system to replace the current one that dates back to Apollo. The new system does away with canisters of lithium hydroxide used to absorb CO2 passively. These canisters have to be replaced when they are saturated. The new “rapid-cycle amine swing-bed” system uses two beds of absorbent material. It is also situated on the back of the space suit. While one bed absorbs CO2 and water vapour exhaled by the astronaut, the other is regenerated by exposing it to the vacuum of space, which causes it to vent the absorbed gases. The beds then switch roles. The new life-support system will allow much longer EVAs. In Russia, Zvezda has been designing space suits since 1959, when the Soviet Union started preparing for its first manned space flight. Next year it will update the chunky beige Orlan suit, which cosmonauts wear for EVAs at the International Space Station. 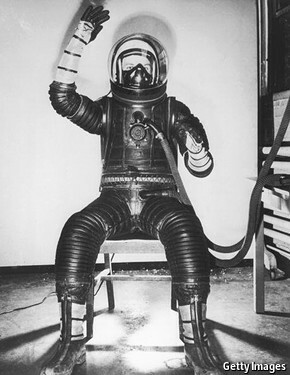 The Orlan suit, a version of which is used by the Chinese, harks from the 1970s. As President Putin has vowed to launch a manned mission to the Moon, Zvezda could get the chance to give the Orlan a more comprehensive makeover. With competition growing in the space business, more innovative spacesuit designs are likely to emerge. The newcomers, like Orbital Outfitters, have bold ambitions to make suits with a flexibility of movement that NASA is only dreaming of. The American space agency says it places a premium on the “flight pedigree” of its own designs even though they may appear to be more conservative. SpaceX says that its spacesuit-design programme is at a too early stage for it to comment. And Dr Newman’s BioSuit, as snazzy as it is, still needs more development before it can fly. 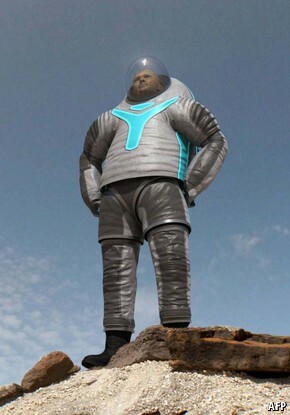 Nevertheless, it might be a good time to become a spacesuit designer.